Lot Size: 6475sq. 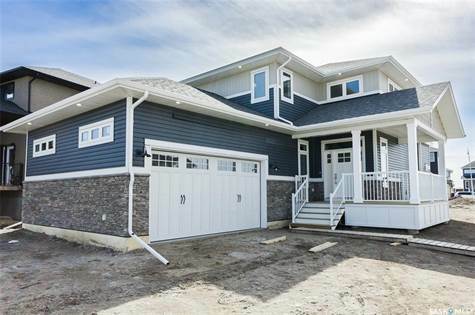 ft. n/a "Corner, Irregular"
Combine high construction standards of a Mike Holmes Approved builder with exceptional design & high end finishes & you have Delonix Homes latest offering.Well set on a corner lot, this 1937 sqft. two storey showcases quality workmanship & attention to the finest details.The welcoming vibe from the front verandah carries to the airy, light filled foyer with soaring ceilings & shiplap feature for added personality.Throughout you’ll find marble tiles, classic trim & crown molding, custom softclose cabinetry, quartz counters, soft LED lighting & functional wide hallways. Off the foyer is a flex room, perfect for an office or media room.Take in the unobstructed view from south facing windows that flood the open concept living, dining & kitchen with light, accenting the honey colored flooring–the latest, virtually indestructible, Armstrong high end laminate.An oversized gas fireplace warms the living room & kitchen that offers an abundance of pot drawers, marble tile backsplash, direct vent range hood, premium appliances & eye-catching island with custom black walnut butcher block.Off the kitchen is a convenient butler’s pantry with a custom 8 lite door.The main floor is completed by a convenient two piece bath & mud room that accesses the oversized garage-fully insulated, boarded & wired for gas & electrical.A wide staircase leads to the master featuring a walk through closet, spa like ensuite with an oversized free-standing tub, separate shower & spacious vanity with large cast iron sink & wall mount faucet.There are two additional bedrooms with built in organizers in large closets, both close to the main bath & a well placed laundry room.The basement is ready to develop & houses an HE furnace, water heater & HRV.This home is built to Delonix Homes high standards of energy efficiency-triple glaze-lowE windows, spray foam rim insulation & R60 attic insulation. There are unlimited options to develop the spacious corner lot with room for entertaining, play areas & additional parking.